If there’s a competition for the longest gap between the first and second time you’ve seen a band then my entry will be Black Sabbath. I first saw them at Reading festival in 1983 and didn’t manage to see the band for a second time until tonight. My original encounter, back in 1983, was a rather strange version of Black Sabbath, though, with Deep Purple’s Ian Gillan on vocals and Smoke on the Water as an encore; and it was mercilessly panned by the critics. Thirty one years later, however, and we are very much seeing a classic version of the band in Hyde Park giving an undoubtedly classic performance. Save from drummer Bill Ward, who is replaced by Tommy Clufetos from Ozzy Osbourne’s solo band, it is the iconic Sabbath line-up with Osbourne on vocals, Tony Iommi on guitar and Geezer Butler on bass. Osbourne’s ups and downs have certainly been well-documented and Iommi has been undergoing debilitating bouts of chemotherapy over the past two years. All of that is a world away from tonight’s performance, however, and the band members are all blisteringly on form. They commence with a stunning version of War Pigs and one by one the classics are reeled off: Snowblind, Fairies Wear Boots, Iron Man. The sound is great. 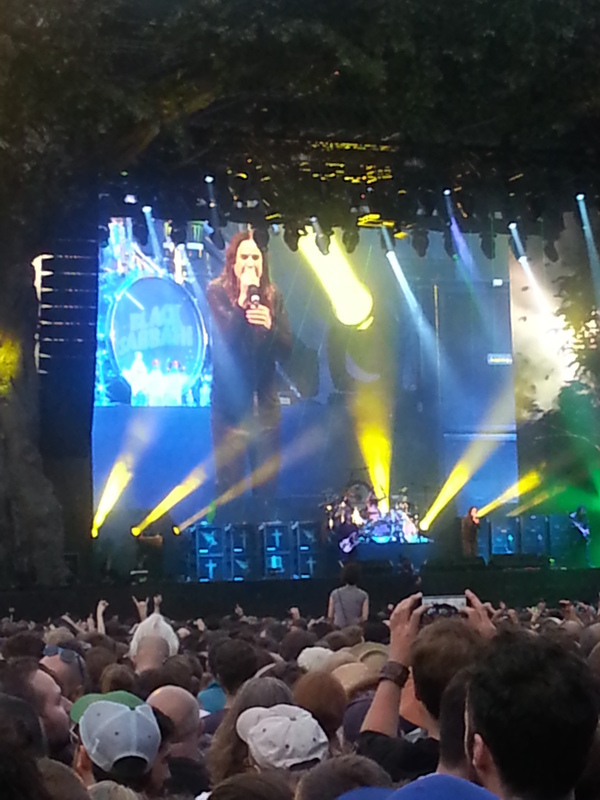 The guitars, drums and vocals are everything you would want at a Sabbath gig. The visuals on the big screens behind add to the atmosphere of the music and the huge and good natured crowd loves it. The set-list is vintage Sabbath, with two tracks from the recent comeback album, Age of Reason and God is Dead?, thrown in. The 13 album was more than just a comeback album, though, and God is Dead?, performed towards the end of tonight’s set, is a real classic that easily sits alongside other Sabbath classics of the early 70s. That was followed by a well-received Children of the Grave. A hugely appreciative Osbourne thanks the enormous crowd and the band leaves the stage. Everyone knows how strict Westminster City Council is when it comes to their 10.30pm curfews at Hyde Park. But there were still some time precious minutes left and what everyone in the crowd wanted was for Black Sabbath to come back on and give us Paranoid. And that is exactly what we got, not only Sabbath’s best known song but one of the greatest rock tunes of all time. It was the climax to an utterly stunning evening. Iommi has hinted in interviews that after Hyde Park there may not be an opportunity for the band to tour again so this could be Black Sabbath’s last ever performance. If it is then what an absolutely stunning performance to end on. 10/10.